While a few beauty brands are in the midst of rolling out fall collections (I know we're all tired of hearing this, but seriously, in July?!? ), Giorgio Armani Beauty decided instead to release a capsule collection of just six Eyes To Kill Intense Eyeshadows and two eyeliners to tide us over before the big show. The eyeliners are run-of-the-mill black and brown, so I didn't swatch them, though I did purchase them. These colors are true to the eye, though Rose Titanium is pinker and Rusted Gold has more multi-dimensional sparkle. I don't remember if we already had the ETK Intense conversation on Messy Wands. My take is: great, unique formula, long lasting, amazing color choices, but by virtue of it being in a pot I just don't reach for it as much, and because of that I am now very wary of being drawn to any of them because of the seven I own that I have rarely, if ever, touched. That said (and this comes as a surprise), I find myself curiously attracted to Carat Gold. Giorgio Armani Eyes To Kill Intense Eyeshadows retail for $32 and can be found on giorgioarmanibeauty-usa.com and nordstrom.com. I have two of these (a gold from Holiday 2011 and a champagne copper, which I think is no9). I find them too shimmery to wear during the day and as I don't go clubbing that often I don't use them. They are super metallic. Xiao, oxidized silver is a must have. the runner up would be smokey copper. Which one do you like most? This is really weird, but the PR info I got says 27 is Red platine and 28 is Oxidised silver! Anyways I also swatched the whole bunch yesterday and purchased 25 mwahaha. Did you get any? baby in a corner- unfortunate :/ I really like the formula. Thanks for swatching these! I thought I'd want 24 based on the description, but it looks darker than I thought. But 28 will be mine - it looks gorgeous and unique! These are to die for. Love them all! Hey Xiao, actually I checked with Danielle and the French Sephora website and came to the conclusion that the PR info I have access to probably made an oopsie there! It would make a lot more sense the other way around, so I put an "EDIT" part in my post now! And uh, believe it or not, I just realized that the PR info mixed Carat Gold and Rusted Gold up! Man! I think 26 (Carat Gold) is gorgeous and versatile! I love 24 as well but was a bit worried it'd be a bit too dark to be versatile. Urgh! They are coming out with too many! I can't keep up the ones I want (esp since I can't just run out and get them y'know...) I do love these though. Perfect with just 1 colour and excellent for a lazy (but polished) eye look. I really need to stop coming to your site, but I lurrrve you too... such a catch 22. 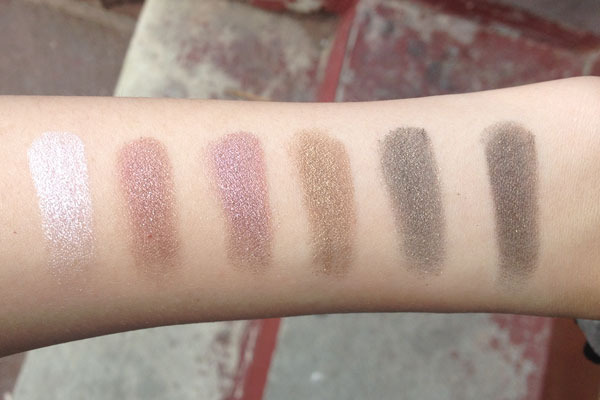 Thanks for these swatches. I wanted to love shades 24 and 25, but they just ended up being way too dark for my complexion. They're so pretty and I kept trying to convince myself to go for it, but seeing your swatches and realizing they look as dark on you as they do on me makes me think twice about them. I can probably only use them as liners. I'm envious if you can wear 26. I'm super pale (NC10/15) with an olive yellow complexion, so shade 26 completely washes me out!